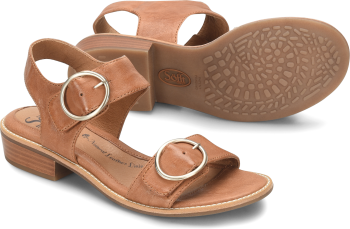 Product description: The Innis is the ultimate essential sandal with a simple, but sophisticated look. A subtle wedge and comfort footbed add stylish comfort. PLEASE bring back the black patent! I wore my current pair out! 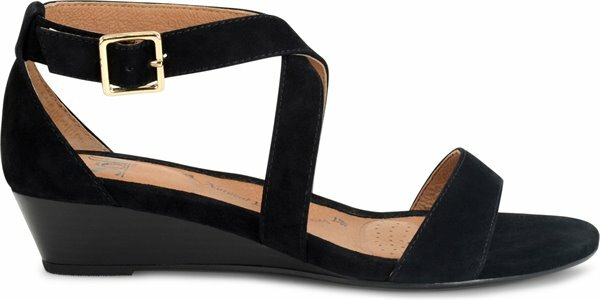 Love them in black patent and searching all over the web with no luck. I have bought all sizes in wide. You do. It sell enough wide in this style. You seem to run out of the wide size. This sandal has a weird fit, and it depends mightily on those skimpy straps to keep the sandal on the foot. I nearly always wear a wide but this sandal is almost too wide, especially in the heel. And there is little arch support for my foot with this design. It's so pretty! Would live for this to have been better for me. I have foot problems, so I rarely get a pretty shoe with a good fit and feel, so this might be more me than the shoe. I was hoping for more cushion and support in the footbed. 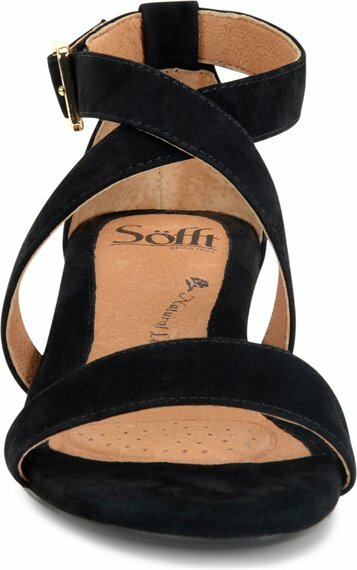 I LOVE my Sofft shoes! I purchased these shoes in silver for my daughter's wedding. I wore a long, elegant navy blue dress, and the silver shoes were perfect! I have multiple foot problems, but wore these shoes all night in absolute comfort. I believe I was one of the only ones in the bridal party that didn't kick her shoes off! 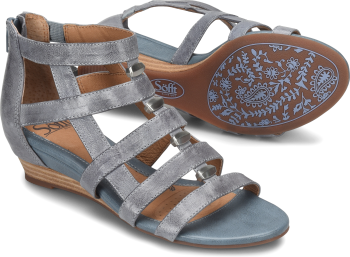 Thank you Sofft shoes!! Love this shoe super cute. A little expensive and don't know why they are $30.00 more than the other colors of suede.Ended up getting them at Zappos couldn't find my size at any other store. This is such a comfortable shoe. I originally purchased in black patent leather. I wore the original one out. THen I purchased another black patent leather and gold. Fits true to size. So comfortable! I have this sandal in the Black Patent. They are very comfortable and true-to-size. Well-made, too. I'm going to buy a second pair in a different color. I am recovering from foot surgery and the orthopedist recommended that I use a wedge. I had shopped for shoes at 10 different stores without success. Thank goodness I found this shoe. I needed a pretty shoe for my daughter's wedding. I can even dance in them! I will be ordering more of your shoes as they are comfortable and pretty. These sandals feel like gloves on my feet. They can be dressy or casual depending on your outfit. The arch support feels so good and in the right position. The heel height is just enough! I was informed the Innis, BlackPatent, is available in a 11M.How do I order a pair, in size 11,when your websites stop at size 5?Thank you. A great shoe! The fit is true to size and the heel height is perfect for me. I ordered it in the silver/pewter color. I absolutely love this shoe! 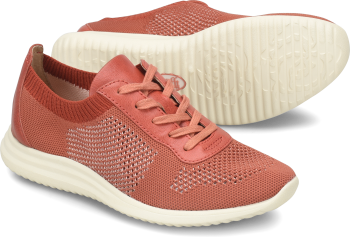 I work for a high end retailer and need stylish, comfortable shoes and these are perfect. Since purchasing my first pair, I've added three more to my wardrobe. Excited to see the new colors (olive and tobacco) and hoping a neutral tone like taupe or beige suede will be offered. My only caution would be the patent leather. They are a beautiful shoe but don't have as much give as the suede. Since I'm on my feet all day, I don't wear them to work but they're a perfect dress shoe.